Cotingas are polygynous birds. 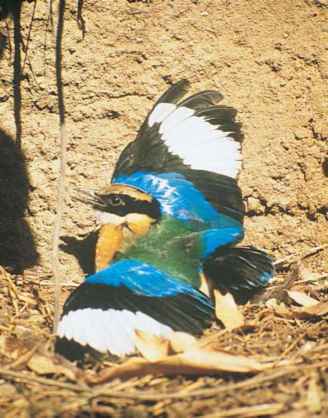 Several species of cotingas (e.g., Pyroderus scutatus, Perissocephalus tricolor, and Phoenicircus), form "tight" leks where the males compete for the attention of a female through elaborate displays. 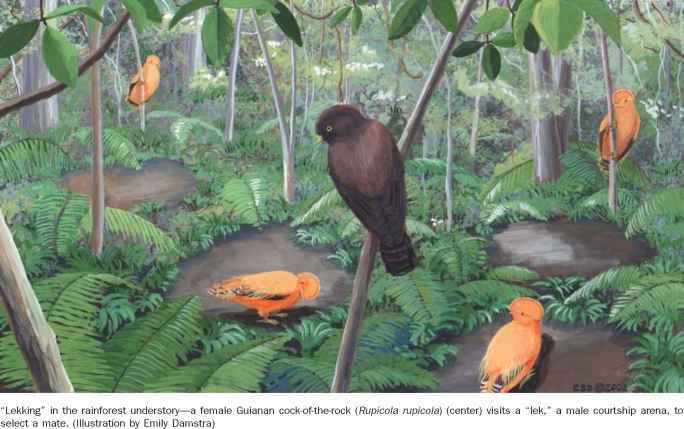 Other more drab species such as Lipaugus and Querula purpurata, will compete for females in "loosely-attended" leks through their loud calls that carry far in the tropical forest. In yet other species, a single male will court a female, but not without the presence of other males. "Flags" (signals designed to attract attention) during flight serve as courtship signals in species such as Xipholena, whereas an elaborate flight entails the courtship for species such as Gymnodoerus and Haemotoderus. Most species lay a single egg, concordant with Rensch's rule of clutch sizes decreasing in more equatorial species; however, clutch size may reach three eggs in species such as Phibalura flavirostris. While egg color varies from yellow to brown among species, most taxa have flecking at the blunt end. Females incubate alone in some genera, such as Cotinga and Querula, whereas in others males assist during nest building (e.g., Phibalura) or incubation (e.g., Iodopleura and Phibalura). Aggressive nest defense has been observed in certain species as well. Incubation is generally 25 to 28 days for the larger species, but may be of shorter duration for the smaller species. Nests vary considerably from species to species. Species of most genera (e.g., Cotinga, Querula, Xipholena, Perissocephalus, Lipaugus, and Cephalopterus) build a small platform of sticks in the fork of a tree. Other species build a smaller nest with a shallow cup (e.g., Phibalura, Gymnodoerus, and Iodopleura). The chicks hatch blind and featherless, quite dependent upon the parents. Females alone care for the brood in genera such as Cotinga and Procnias. In other species (e.g., Querula purpurata) multiple helpers care for the brood. The young leave the nest at, or slightly more than, one month of age. Some cotingas have more than one clutch per year.